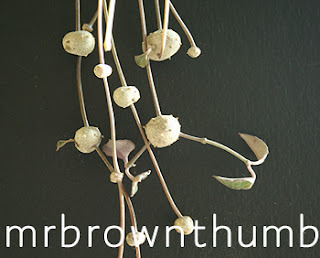 String of Hearts Vine, along with Rosary Vine, is a common name for Ceropegia woodii. Ceropegia woodii is a popular hanging houseplant because it is easy to care for, beautiful and being a succulent it is very forgiving to being under-watered. When being grown indoors as a houseplant it is recommended to grow it in a very bright area where it receives direct sun. I grow my plant in a west facing window and don't supplement the low light levels with grow lights and it does pretty good for me. If you're interested I've written a previous post titled Ceropegia woodii: String of Hearts where you can see a photo of the flower. While better known for the foliage and tubers this plant does produce a small flower that is as interesting, if not more, than the tubers and leaves. After you've grown this plant and observe the way it produces tubers along the vine it becomes clear why it has been nicknamed "Rosary Vine" or "Rosary Plant." The tubers growing along the stem do in fact resemble the beads on a Rosary. They become more pronounced if you grow this trailing vine as a hanging houseplant and allow the vines to get longer and drape towards the floor. Famous for the shape of the leaves you can see why it is called "String of Hearts." The diminutive foliage develops to resemble little hearts and they grow along the stem along with the tubers. In full sun the leaves and stem develop a rich purple hue to them. I purchased this String of Hearts plant at a local Home Depot greenhouse. Another String of Hearts, though the leaves on this houseplant are sparser and look more like arrowheads, it develops the same flower as the houseplant in the picture above and in the link above. This was my first String of Hearts and I bought this plant at Jamaican Gardens; a nursery just north of Chicago in Morton Grove, IL. 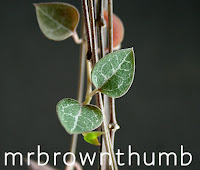 You can click the pictures of these String of Hearts vines to get a larger view. Propagating this succulent plant is extremely easy and you don't need any special tools or rooting hormones to make more plants. What you do need is a plant that has produced tubers and a fast draining soil mix. 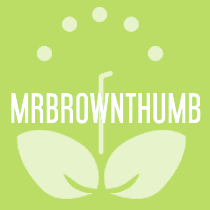 I use a cacti and succulent potting mix that I amend with perlite for my succulent plants. To propagate this plant simply take a developing tuber and place it so that it comes into contact with soil. The soil should be moist but not kept soaking wet as too much water will rot your tuber. After a few weeks gently tug or lift the tuber to see if it has rooted. Once it has rooted you can remove it from the original plant by snipping off the vine(s) that attach it to the parent plant. If you're growing your plant as a trailing plant you may notice that the top of your plant becomes bare if sunlight doesn't directly hit the leaves and vines on the surface of the soil. I personally don't mind when this happens because it exposed the interesting caudex that develops in older vines. But if you'd like your plant to look lush simply coil the vines with tubers on the surface of the soil and allow them to root in your pot. When you don't have room to grow this plant as a hanging houseplant in a window you can wrap the vines along a wire topiary frame. This is one of my favourite of houseplants, although to look at my plant now, you wouldn't know it. I gave it a serious haircut and repotted it, then forgot about it...so the strings are more than a little etiolated. Plus the dear kitties seem to like to dine on the shoots, so it needs to get hung up out of reach again. You're spot on about the flowers being interesting--they aren't showy enough to appeal to some, but they quite delight me when they show up. Two of my cats got very sick from eating this plant. I couldn't figure it out at first but then caught the youngest cat (about a year old) munching on the leaves, and when the extras fell to the floor my two older cats munched on the leftovers. Over 500 bucks on two cats trying to figure out what was wrong! I was given a list of poisonous plants by my vet (and I checked it out with two other vets) and I was amazed how many plants were on the list. Some mildly toxic to highly poisonous to point of killing your cat. Just be careful with this plant if you have cats. You know if I keep reading your blog I might get the idea that I can grow houseplans. I'd give you a list why we don't but the internets don't have enough space. I used to have a beautiful String of Hearts plant, but when I moved across the country, I gave it to a friend. It is still living. I have yet to find one here - if I do, I will grab it up. I love those tubers. It looks great alongside a strawberry begonia vine. I got mine through Amazon.com - I had one a long time ago & was ecstatic when I found I could get one through Amazon. I didn't know they were considered to be succulents. I remember seeing a little Japanese woman asking the garden clerk in Lowes if they had any String of Hearts and how she lit up when they had 3 plants. She bought them all with a grin a mile wide. Wow, I've never heard of this! I was looking for a new houseplant or two, especially hanging plants...thanks! Thanks for the great info on this plant, I have tried to grow it several times over the years and have not had much luck, now as soon as I find another one, I will try again. Thanks for stopping by and commenting. There's a variegated form of this plant that is even more fantastic. I hope to find it someday in a store near me. I love this plant. It just looks so dear to me. Don't know if you order online, but I just ordered the variegated version from glasshouseworks.com. I noticed you said you were looking for the variegated. I've ordered from there before without any problems. The one I currently have is from hirt's. I can't wait to get the variegated version. Believe it or not out here in California I don't see these in the nursery's very often. So I had to resort to ordering online. Love you page and your pictures as well. However, when I saw this post for String of Hearts, bestill my heart. I have been searching for the name of this plant for years. In hindsight, how silly of me not to recall "the string of hearts" as a search. Thank you so much for posting this. I now know what to look for and perhaps, where to buy one. 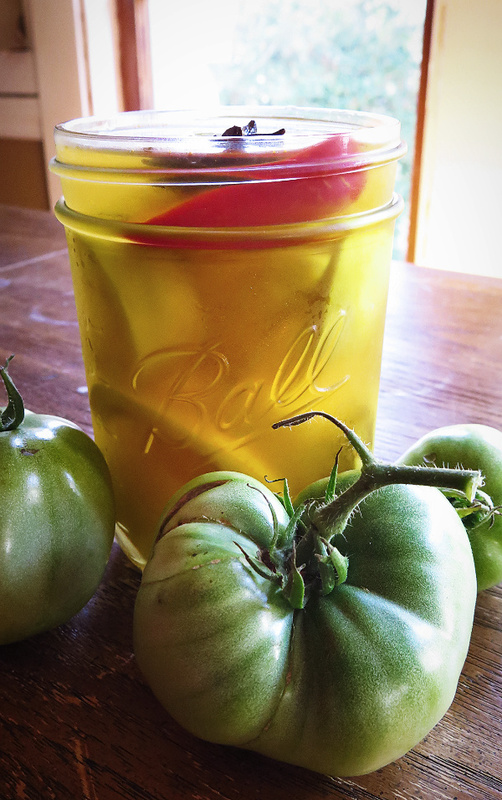 GREAT post, Wonderful blog, Huge Thank you! Bookmarked!!! Louise, You're welcomed and thank you for introducing me to National Sweet Potato Month. Had no idea it existed. Hope you get your own String of Hearts plant soon! I have three separate plants and would like to combine them into one pot, exactly how do you re-pot these plants? The easiest way to do this would be to get a pot large enough to slip the three pots you have into. You can gently shake off as much of the old soil as possible from each plant to make room for fresh soil in the new pot. Great blog! I have my grandmother's string of hearts that she gave me in 1974 or 1975. After years of neglect, it is still going strong. Soon it will have new soil and will be fed regularly. I am looking forward to seeing the flowers again - a true family heirloom to me! the rosary plants that my sister and i have also come from our long passed nana in vermont. Mine is about 35 years old and has survived many moves. This evening i spent a long time disentangling it as the pot is cracking. Hopefully I'll be able to get several tubers started to pass on to my own daughter and some friends. And NO MORE neglect of a plant that reminds me so of someone i dearly loved. Also have a split leaf begonia -about the same age- that came from one leaf of my mom-in-law's plant. It also is hopefully getting a new start! Hi, my string of hearts was infested with gnats and is dying. It even fell out of the soil it was in. I'm upset because I loved the little flowers it produced. It also grew some seeds. I'm combating the gnats as best I can. Any hope for this plant? Maybe if I replant the tubers? Hi, was wondering how to plant the seed to make them grow. I also just moved and my hearts really like the move. They are flowering and have many seed pods. Hope you can help. How do I start the seeds? Wet dirt or dry. How long with it take?